Lesy's first book Wisconsin Death Trip was an exploration of the darker fascinations of Victorian America. Dreamland revisits that work, portraying the whole of the country at the turn of the century with some of the most remarkable postcard images ever assembled--enlarged to full page size--and a timeline of odd historical events. Lesy's dawn of the modern age is a time of vertigo and imagination. Few others have merged history and photography as meaningfully as he. 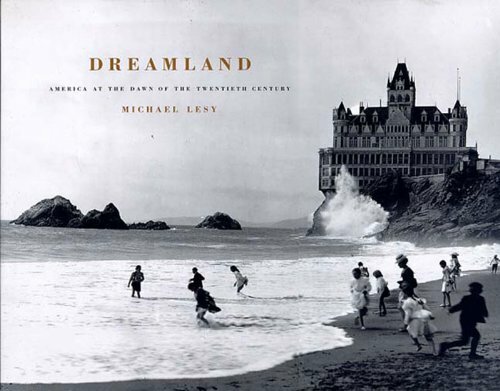 Historian Michael Lesy, author of Wisconsin Death Trip, has produced another haunting volume with Dreamland. The book chronicles a day in the life of America at the turn of the 20th century, an optimistic, peaceful time. Lesy chose 208 black-and-white pictures from the archive of the Detroit Publishing Company, the hugely successful postcard business. The images depict skyscrapers under construction, bustling urban streets, farmers and dusty country roads, and the glories of the newly charted American West, with its cowboys, miners, and distant prairie towns. The atmosphere of order and calm portrayed in the photographs is deceptive, as Lesy's thoughtful essays reveal.